AMDA | AMDA News - Chris Jackson wins a Daytime Emmy! Congratulations to AMDA alum Chris Jackson for taking home his first Emmy Award for “Outstanding Original Song” this weekend at the 38th Annual Daytime Emmy Awards! Chris Jackson (lyricist) and Bill Sherman (composer) wrote the award-winning original song “What I Am” for the beloved children’s television program, Sesame Street. Black Eyed Peas' singer Will.i.am performed the tune, along with the muppets, in a segment that has now captured over 4 million views on youtube. Chris Jackson was also nominated for his original song “Rakhi Road." Sesame Street, notably nominated for sixteen awards, took home eight Daytime Emmys in total. Mr. Jackson and Mr. Sherman previously worked together on Broadway in the 2008 Tony Award-winning production of In The Heights. 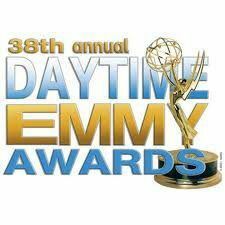 The 38th Annual Daytime Emmy Awards Broadcast was hosted by Wayne Brady in Las Vegas, with additional winners announced at a Gala in Downtown Los Angeles. Full list of Creative Arts Winners.